So many reasons to love and use chickpeas (garbanzo beans). They have a mild nutty flavor that compliments salads, are easy to mash with a buttery texture middle, contain load of nutrients including protein, fiber, vitamins, and are featured in dishes around the world. They contribute to supporting digestive and colon health and many people I know that cannot tolerate other beans, have no trouble with chickpeas. Have you ever had falafel? 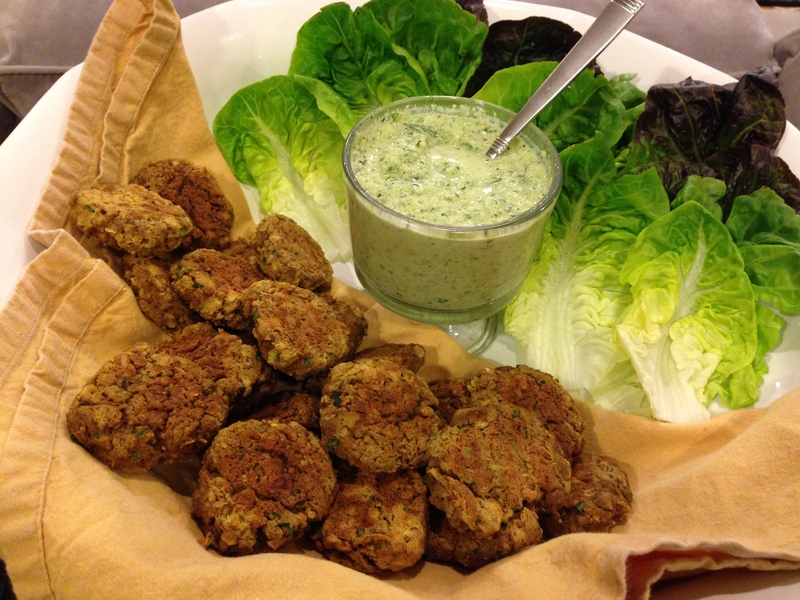 Falafel is traditionally a crispy, fried fritter made of ground chickpeas (sometimes fava beans) mixed with spices and herbs. It is normally eaten wrapped in pita bread and dressed with tahini sauce. Tahini is a rich paste made from sesame seeds and serves as the base. I like to fill my falafel sandwiches with lots of salad and include yogurt and lemon juice in my sauce so that I can use less tahini in it. You can find tahini paste in the international aisle of most grocery stores and Trader Joe’s makes a ready made tahini sauce when I’m in a pinch but I dilute further becaue I find it to be salty. Be warned, I’m about to make a stereotypical statement! Indian people (at least many of my vegetarian relatives) who immigrated to the United States in the 1960s and 1970s quickly decided on their two favorite new foods in the land of opportunity: pizza and falafel! Both seemed too difficult to make at home and were safe choices to eat out for vegetarians. 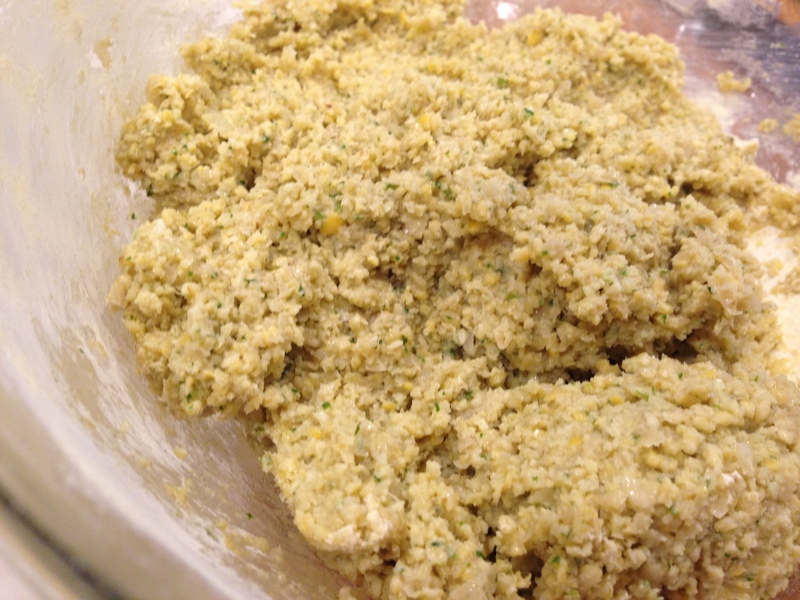 When falafel mixes were released in grocery stores, it was initially exciting but they are also pretty dry, very salty, and need to be deep fried. 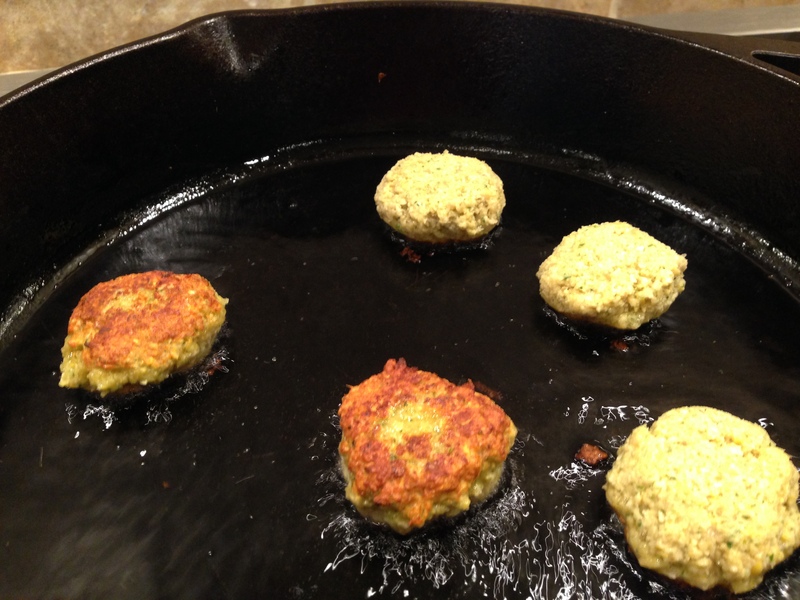 After trying many online from-scratch falafel recipes, I’ve come up with one that works well for me. The inspiration was finding the best falafel I’ve had at Little Village Grill in Uptown Charlotte. Rather than dense little patties, LVG’s fritters are tender with fresh pieces of chickpeas (also called garbanzo beans) throughout. LVG is located at 710 W. Trade Street and although there are a few stools, we tend to carry-out. Kabob-je is a good choice too in Matthews, a suburb of Charlotte. I love Taim in NYC as well. 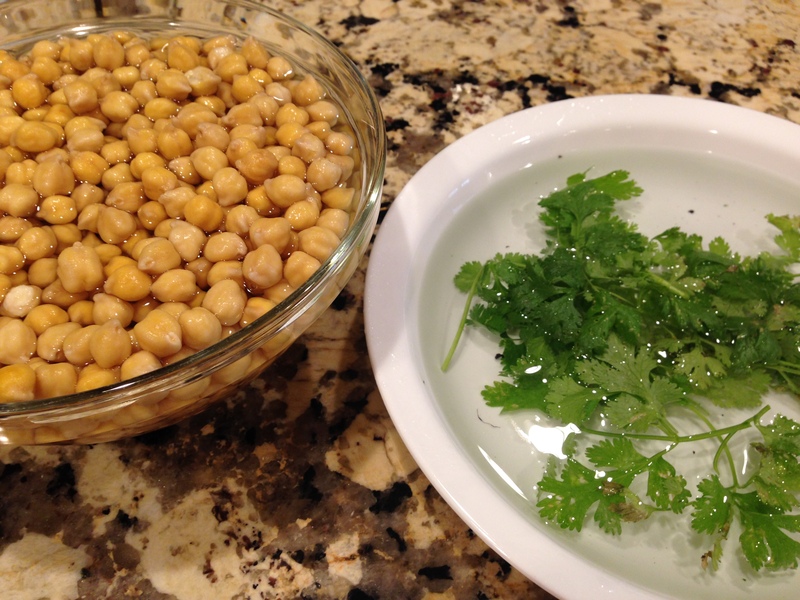 To cook: Soak chickpeas/garbanzo beans overnight or 8 hours. Drain and rinse. Cover with water in a pot, bring to a boil, then simmer covered for 1.5-2 hours. Salt as desired when done. If I leave them uncooked like most falafel recipes call for, then I put them to soak in the morning for 6-8 hours. You can also soak ahead of time, refrigerate, and use however you would like to within a few days. I used fresh herbs from my garden. I was suprised that my cilantro went strong because that’s one herb that I hadn’t been able to cultivate well. It is now producing these smaller tender leaves and flowering. This apparently means it has “bolted” and therefore it will grow seeds rather than the plant. A little tip for produce that has soil/dirt/sand is to soak it in water and all the sediment will sink to the bottom. Then you can just lift out your herb/greens/etc. I prefer to use my food processor over a blender for easy of stirring the ingredients throughout the process. The key is to pulse everything finely enough so that the “dough” will form into small patties but not so much so that it turns into hummus! You can pan fry or bake. I usually serve these as a topping on a salad, in pita pockets, or in lettuce wraps as I did below on a ladies’ night get together. Regardless of which way we eat them, I always make a tahini sauce too. The one pictured below is more of a tahini-tzatziki and green because I blended in some cucumber and dill. I provided my usual tahini sauce recipe below though. I find it easier to emusify the tahini with the water with a blender but you can hand wisk it. 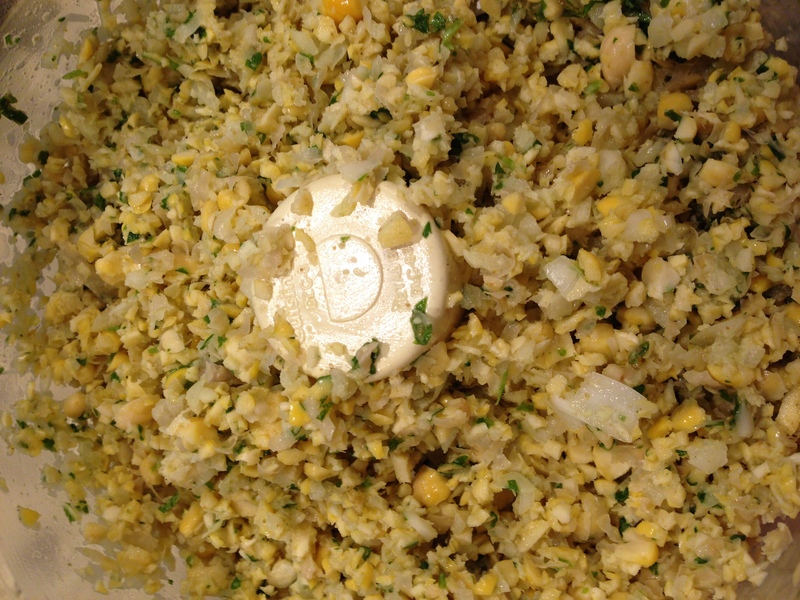 If you do this, it will look like it is never going to mix but it will soon turn into a creamy white dressing. I incorporate yogurt into my tahini sauce because it lightens the calories with a healthy replacement. 2.5 cups soaked uncooked chickpeas or 2 cartons chickpeas or 2 cans chickpeas (garbanzo beans) (* I buy the dry form in bulk or in packages at Whole Foods’ in the 365 store brand. Otherwise Whole Foods brand or Target’s Simply Balanced organic low sodium version in cartons or cans of organic beans in non BPA lining cans. By the way, any recipe works equally well with either a 13.5 oz carton=15 oz can=2 cups home soaked and cooked beans. 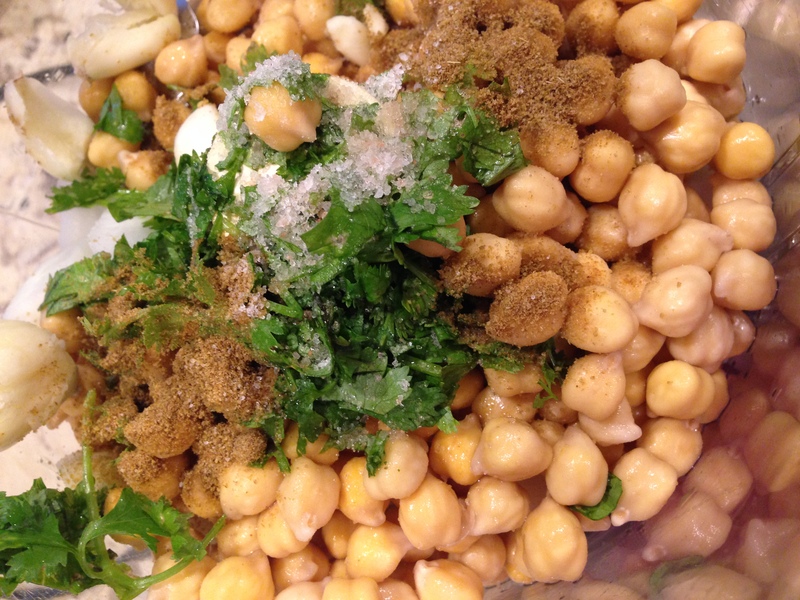 Place chickpeas in a food processor and pulse a few times. Then add in onion, garlic clove, and herbs. Pulse again. Add in spices, salt, and baking soda. Scoop out mixture into a bowl. Add in gram flour. This will help absorb some of the moisture. Cover and place in fridge for a few hours or you can ever prepare this 1-3 days in advance. If you don’t have time to refrigerate, just add more gram flour until you can form walnut size balls and lightly press into patties. If you are using cooked chickpeas, and opt out of using a food processor, use a potato masher to mash them up first and then you can fold in the rest of the ingredients. To cook: Either pan fry on each side for approximately 3 minutes until golden brown or to bake, brush with oil or spray with cooking spray on each side. Then bake on 375 degrees for 12 minutes on each side. I like to top on a salad ( chopped lettuce, bell peppers, cucumbers, tomatoes), fill a pita with the salad + 2 falafel, eat in lettuce wraps, or in a tortilla. Whisk together or in your blender or food processor, combine the following: 2-3 tbsp tahini paste, 1/3-1/2 cup any kind of plain yogurt, 1/3 cup water (more for thinner consistency), 1 tsp lemon juice or apple cider vinegar, and 1/2 tsp salt. Yields approximately 1.25-1.5 cups.